I am a very emotional and sensitive person. Because of that, people directly and indirectly affect my state of mind. There have been many instances when I’ve felt that my mind, passion, and energy were under control, but they were lost, subconsciously. Some days, my mood was up and then down, a roller coaster that left me without the drive to accomplish routine activities. On other days, my adrenaline was racing, and nothing could stand in my way – all because of the various people I interacted with on a daily basis. In this work, I present the uncertainty of the state of mind, which may be controlled, but sometimes not. Due to that uncertainty, the interpretation varies, depending on the states of mind of the viewers themselves. The cloth covers the face to symbolize the protection of identity, resulting in confusion for the shrouded figure. Covering the identity represents the embarrassment of the masked emotion and the loss of direction. 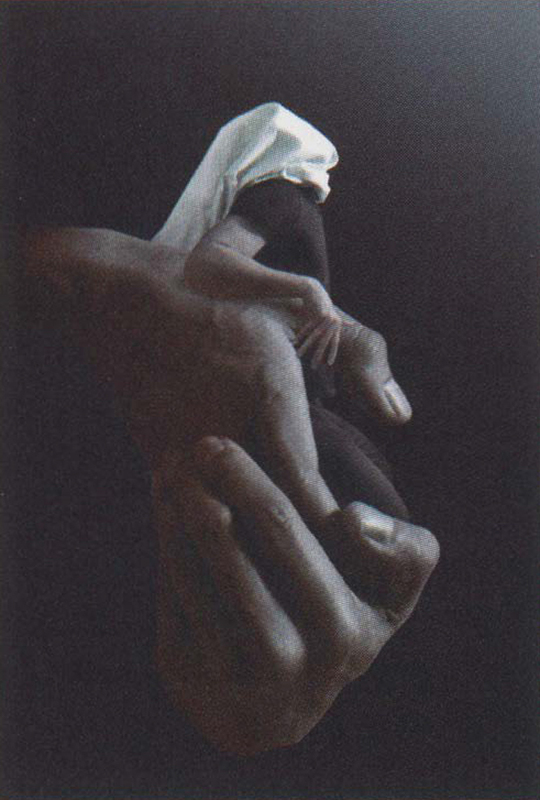 The original figure and hand models were photographed, in color, using a digital camera in a studio setting. Next, all images were manipulated with Photoshop, which allowed for traditional darkroom operations, but in a digital setting. Having control over the various image adjustments such as, contrast, exposure, and color helped facilitate creation of a particular mood while maintaining a surrealistic style within the imagery.